...of Wadden Sea World Heritage education and interpretation is a shared responsibility and common task of the public authorities, NGOs, and other private stakeholders on the national and trilateral level. The implementation on the national level follows National Work Programmes – existing or future strategies of the three Wadden Sea countries respectively different regions – by public as well as private partners, i.e. National Park Administrations, NGOs, visitor centres, schools, etc. The programmes comprise regional networks, initiatives and activities as well as regional education products. The regions identify regional representatives to represent the regional Wadden Sea education sector in the Trilateral Education Work Programme.Evaluation and monitoring activities are carried out according to the regional strategies and standards. Quantitative data on the number of visitors in centres and participants of guided tours – recorded on a local, regional and national level – adds to this with a view to working towards a constant, harmonised and coordinated monitoring of education in and on the Wadden Sea World Heritage throughout the entire region contributing to the Trilateral Monitoring and Assessment Program and Quality Status Report. The national education programmes and products are financed on the national level by the various public and private bodies. The regional representatives’ contributions to the trilateral work program is either assigned as part of their job or compensated by national funding. 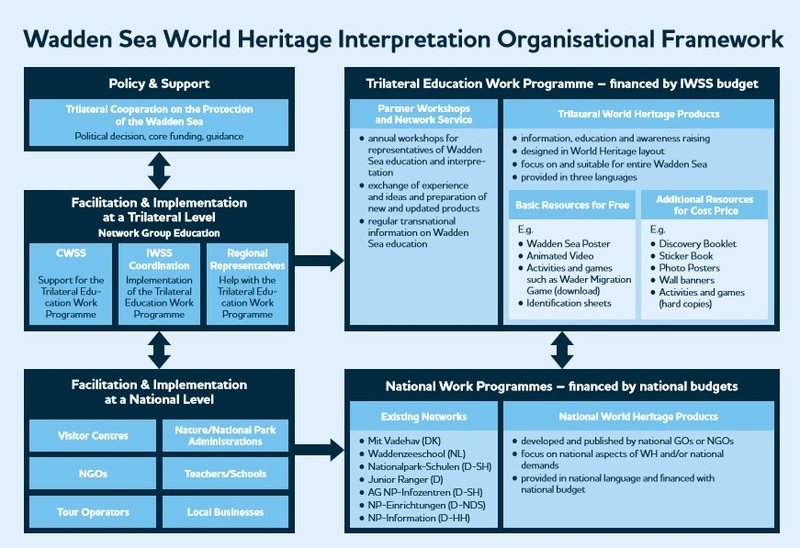 The implementation of World Heritage education on a trilateral level – according to a Trilateral Education Work Programme – is a core task of the Trilateral Wadden Sea Cooperation, following the political decision taken during the Trilateral Governmental Conferences and with financial support of the TWCS and guidance provided by the Wadden Sea Board and the Task Group World Heritage. The Trilateral Education Work Programme – further specified in a separate working document – builds on the existing structures of the International Wadden Sea School (IWSS) and comprises two key work fields: facilitation of network services and provision of trilateral education products. The IWSS coordinator (at present provided by WWF Germany) serves as a key facilitator of the Trilateral Education Work Programme and closely cooperates with the Common Wadden Sea Secretariat as well as with the regional representatives of Wadden Sea Education. Together, they constitute the Network Group Education (NGE) to link the trilateral and regional initiatives and to ensure that alltrilaterally developed activities and products are suitable for the various national situations and meet the demand on a common denominator. The Trilateral Education Work Programme also constitutes the educational component of the future Wadden Sea World Heritage Partnership Centre. (to be discussed by WSB) A qualitative and quantitative evaluation of the Trilateral Education Work Programme is carried out prior to Trilateral Governmental Conferences. The programme will also be evaluated annually by the Network Group Education and amended if necessary. Feedback on the ongoing activities and services is continuously collected and discussed both with the Network Group Education and the annual partner workshops. The Trilateral Education Work Programme (IWSS) in its core is financed by the Trilateral Wadden Sea Cooperation. Additional resources from (private) partners – acquired through fundraising and project funding – can add to the core budget and improve the possibilities to provide the necessary services.